Nritta, nritya and natya are the three inherent components of Indian classical dance, and my attempt is to showcase any event or performance which focuses on any one of these features of dance. Further, to elucidate the independent nature of these and how they complement each other. Here, the featured component is nritya, which is interpretive dance. It is related to rasas and bhavas with abhinaya as an important ingredient. The event titled 'Depth in Emotion' was held by the Desmania Foundation at Sandhya Raman's Atelier. It was not just a dance performance. It was a lesson in abhinaya. The two gurus, Jamuna Krishnan and Ramya Harishankar, are disciples of the legendary Guru Kalanidhi Narayanan, one of the most iconic teachers of abhinaya, and the event was about her teachings. Jamuna Krishnan, also a former professor of Economics in Delhi University, received her training in Bharatanatyam from K.J. Govindarajan of the Thanjavur school and later from Guru Kalanidhi Narayanan. She has many illustrious students to her credit. Ramya Harishankar, the founder of Arpana School of Dance in California, did her training under Swamimalai K. Rajaratnam and 'Kalanidhi Maami', as they both referred to her. The space at Atelier gives you a sense of one-to-one communication with the artiste, and makes the interactive session intimate. Ramya was the first to perform. She took a popular composition of Purandaradasa. The gopikas are discussing among themselves the innocence of the child Krishna. They say Krishna is not innocent. How can he come and ask for the secrets of childbirth? This could not come from a young child. One says, 'I was going with my friends to the Yamuna, he caught me alone and harassed me incessantly. We cannot contain him, he is no innocent.' Another says, 'The other day, as I was churning butter, he arrived and asked for some. As I gave him some butter, he pounced on me and put his face next to mine and asked me to fall at his feet; is that what you call innocence?' The third says, 'I was half-asleep and mistook him for my husband; I put my arms around him. As I realized it was him, I pulled back my arm and he told me, don't you do that, for I am Purandara Vitthala.' Ramya could very aesthetically enact the attitude of the gopikas, each with their own complaints, the most effective being Krishna pouncing and putting his cheek next to the gopi's. In between, Ramya spoke about Kalanidhi Maami. "Some of us have done work with her and spent time with her, absorbing her philosophies and ideas. She was one of those progressive teachers who never teach their students like ABCD in class. In fact, Maami would take a line of a poem and give us multiple interpretations. As students, we would absorb and observe with a discerning eye because this would bring out little nuggets of brilliance. As homework, we would have to sift through what had been done in class and put it together, and breathe life into it, logically and methodically. It was not served to us on a platter. Whatever we do is a result of her philosophy and whatever voice we have we find to express in our own way. I will do the same piece each time with slight differences, absorb, immerse and make the piece my own. The same piece performed by three students of Maami will never be the same. Maami would teach only three-four lines in a class, for which we were lucky, and we would make it our own." Next, she portrayed the khandita nayika, the nayika being shown as disappointed, depressed and upset with the nayaka, who has betrayed her. 'Don't touch me, keep your distance. You have gone beyond your limits. Don't explain, I have no ears for that. You had gone to her, praised her, admired her and made promises. Keep that hand to yourself. Find your way back to her,' says the nayika in the composition, all this with a smirk. As the nayika, Ramya exhibited the anger in her eyes, her contempt. She played the nayaka too with élan, getting the male mannerisms spot-on. Continuing her talk on Maami, Ramya said that the formulae Maami gave her have always been used. She presented Ganga: Life as a River, a semi-postmodern work, in which she did three pieces to the spoken word. The poetry was in English, about the three different stages and challenges a woman goes through, for which she used Maami's formula to interpret and explore. In another piece, she speaks while dancing as part of the storytelling, and this has been used in schools in California. She talked about using classical and folk dance idiom to film songs in six different languages in Celluloid Classics, a collaboration with Radhika Shurajit. It was a blend of film songs from the 1930s onwards, starting with M.S. Subbulakshmi's Meera. Shurajit, who is a disciple of Maami and the Dhananjayans, had given her the next piece to dance to. "It has the quality of a padam," said Ramya. To melodious and soulful vocals, she showed the nayika sleeping. She hears a knock at the door and opens it. Surprised to see the nayaka, Ramya's face registers pleasure, her heart flying with ecstasy like a bird. They embrace, she holds his face and their eyes meet. Combing her hair, applying kajal, bindi, ornaments, she shyly looks at herself in the mirror and covers her face. They embrace again and finally, she closes the door and sleeps again. The interpretation that I could draw was that either it is a dream that her long-lost love is back, or that he is actually back and they have a union. Ramya's movements and mukhabhinaya were subtle and graceful, each expression minutely depicted and each emotion of being united after a long separation very aesthetically shown. The most impressive scene was when she comes quickly across the stage to open the door and finds him standing there. Guru Jamuna Krishnan took the stage next. Ragini, her daughter and disciple, said that after training under masters, Jamuna moved on to bhakti poetry, particularly north Indian regional shringara and bhakti poetry. The poets that she did research on were Surdas, Meerabai, Tulsidas and Vidyapati. She has incorporated their work into the technique of Bharatanatyam. In this way, she has not only extended the frontiers of her dance style, but has given it a new dimension and perspective. 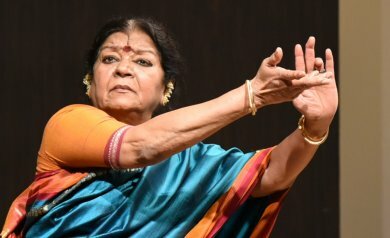 She trained in abhinaya under Kalanidhi Maami for three decades, but her contribution to dance has been her individual research into bhakti poetry. Jamuna Krishnan started by saying that her file and notes are her armour. Abhinaya is not easy to talk about, particularly the depth in emotions. 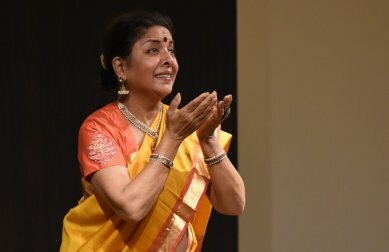 She particularly emphasized the point that whoever has experienced Kalanidhi Maami's abhinaya could not have missed the depth of this aspect of Bharatanatyam. However, over a period of time, with the vast performance space and the joy of dance, abhinaya has been relegated to the backseat for various reasons. "The creative path of dance with abhinaya requires many inputs, like philosophy, religion, architecture, sculpture, music, movement - everything can get integrated and comes across through the language of abhinaya," she said. "I feel blessed that I was exposed to this kind of abhinaya under one of the greatest gurus, and that I was shown a certain window to look around and experience this world through abhinaya. This exploration is still continuing. You find new meanings as you grow old, as you experience new events in your own life and life around you. Your links with abhinaya become different, and what you are trying to say and communicate also becomes different. This journey has taken me thousands of years back, about what was written and sung, and find new meanings in what was taught. The depth of emotions is expressed through music, facial expressions and hastas in dance, and you are successful only if you have a grounding in poetry and literature. A lifetime is required for that. It is essential that a tree has its roots, its branches and myriad flowers. The flowers change with seasons and their colours too, change. This is what abhinaya has done for us. The emotion of love was Kalanidhi Maami's favourite and, of course, it is dear to us all. Every great humanist has called love the greatest emotion. You come across the Almighty on this path of love. Love all living and non-living beings in this beautiful creation of his. The love between a man and a woman is fascinating, with a lifelong commitment." The first composition was about Radha and Krishna, 'Main apno man harat na janu'. Radha says that her heart has gone with Krishna. Has it forgotten its way back? Here, there is a personification of the heart, where the heart is being addressed as another entity. Did it just go away with Krishna, not to return? The composition started with the flute. With soulful abhinaya Jamuna Krishnan expressed the viraha of the nayika through her eyes, that her heart was stolen, wondering whether it had just walked away on its own, like a calf, and forgot its way back. Love poetry forms the basis of bhakti. Madhurya bhakti is where the love is very intense in devotion, like in Meera, Andal and the Alvar bhaktas. In Meera's padavali, there is complete surrender. Sometimes, they talk about love in separation. Many times, love is not fulfilled and the desire, the pangs of separation, form the basis of Bharatanatyam padavarnam. Here, the virahotkanthita nayika is pining to be united with her beloved. In the case of separation, the depths of misery, the depth of pain in separation is easy to understand and can be portrayed in myriad ways, for both the woman and the man, especially in Vidyapati's padavali. It is said that Krishna lifted the Govardhan parvat on his little finger, but could not bear the weight of the kangan in his arms in the pain of separation. He danced on the serpent Kalia, but the pearl necklace on his neck was like a snake to him when he was not with his dear one. The next composition 'Suno anuj, ihi van Janaki priya hari' showed the intensity of misery or viraha of Ram, taken from the Sursagar. With Lakshman, Ram looks for Sita in the forest, not knowing where she is. He is miserable as he calls out for her everywhere in the forest. He has totally forgotten himself. Though he is a god, and with a lift of his finger, can destroy all the asuras and rakshasas to be with his beloved, yet, he is crying and in his pain, he accuses the forest of stealing Sita. He has come to a state where he does not say that Sita is lotus-eyed, or that her face is as beautiful as the moon's, but accuses the lotus of stealing the beauty of her eyes and the moon of stealing her face. The soulful singing by Sudha Raghuraman was moving. Ram is on his knees with his hands folded. He does not talk to anyone, all his thoughts are with his beloved. He wipes his tears and points to the lotus, accusing it of stealing her eyes. It was a touching portrayal. The next piece of poetry was about vatsalya, showing the bond between a mother and her child. Jamuna said that in poetry, as in life, we come to know how much we can do for our children. "Maami would say, my disciples are my children and she would love us all. Surdas describes this love in poetry and also the moment of epiphany." Mother Yashoda is ignorant that Krishna is divine and during the course of the poem, there is a verse that describes the revelation. Babies are fond of the moon and there are poems like 'Chanda mama door ke'. Here, the child is crying for the moon. The abhinaya depicts the mother bringing a vessel and pouring water in it to show the reflection of the moon. But Krishna is still not satisfied and wants to hold it. When he is not able to do it after an attempt, he gets angry and cries. The mother tries to pacify him in her own way, telling him, 'Since you are so naughty, you cannot hold the moon. It doesn't want to come to you.' For the dancer, the interpretation can be, according to Jamuna, that the moon recognizes Krishna, his creator, and so does not want to be in his hands. It is just asking for his mercy - 'sharan tumhari' - and it surrenders. "Maami used to get thrilled looking at the interpretations of Surdas padavali that I had done," she told the gathering. The vocals for 'Tava mukh dekhi darat shashi mai' were by Hemlata. There could not have been a better interpretation and its presentation than Jamuna Krishnan's that day. For the next, she chose another favourite Surdas pada, where Krishna, who is now the king of Mathura, confesses to his friend Udho that the memory of his days in Vrindavan is embedded in his mind. A whole section of Surdas's poetry, the bhramargeet, is about the Gopis pining for Krishna, who has forgotten their love after going to Mathura. That is not true. Krishna says 'Mohi Vrij visarat nahin, hans suta ki sundar gagari, aur taruvar ki chhain' - I have not forgotten anybody, the gopis, mother, father, cows and my calves. Overwhelmed by emotion, Krishna gets his flute out from safekeeping, thinking of the cows, calves, Yamuna, the fish in it, the kunj trees, koel, herding his cows. 'Veh surbhi veh bachh dobhani, gwalan sang baal kolahal, naachat diye gal baahin' - Krishna rubs his hands in despondency and again reminisces about the leelas of Vrindavan, vanquishing serpent Kalia, butter stealing, his mother tying him to the pillar, his apologizing and crying, all that further saddens him. Krishna falls into silence, cleans his flute and holds it to himself. Jamuna said, "I remember the days when Guru Govindaraj was alive and my mother used to be on the veena. This is a continuous work and we discover how to bring a certain aspect to enrich your and others' lives." The vocals for these songs were by Hemlata, Sudha Raghuraman, Satish Venkatesh and Vasanti Rao. In the interaction with the audience, Geeta Chandran asked Ramya, "In a 40-45 minute performance, how much abhinaya can you put in, and in the West, do they perform abhinaya or do they just learn it?" The reply was, "Over there, a student gets to perform solo only at the time of her arangetram. Otherwise, it is a group presentation. I do insist on them learning abhinaya because it was what inspired me to take up dance full time, and also have the privilege of learning from Maami. I found my voice and I owned it. Students can have a different perspective so sometimes I do not insist. When I was teaching a 20-something student a javali, and trying to explain to her that when you open the door and a hunk is standing there, what are the emotions that you feel. The student replied, 'I don't feel that same way.' They don't understand, they don't want to connect. The challenge is to make them learn relevant pieces and they do a padam or a javali at their arangetram. It is not about learning a piece, but it is about deconstructing, understanding and reconstructing. Whether it is Surdas's Hindi poetry or a Kshetrayya padam, is not relevant. The cake must have not just icing, but it is also about the flavour. All the emotions are within us, we just have to manifest them. You don't have to be a murderer to show a murder on stage. Dance and acting is about trying to be something that you are not." I asked both gurus more about Maami and the pieces they had performed. About her long association with bhakti poetry, Jamuna Krishnan said, "Some things speak to you. With Surdas I started in the 1970s. My first project came in the 1980s. In the late 80s, I came up with another section of the poetry. The practice of abhinaya continued at another level. I kept going to Kalanidhi Maami and others. Before doing Surdas's padavali, I did Vidyapati's padavali in 1984 in Delhi. I had taken a year's sabbatical to study it. There was no reference to this study. Bharatanatyam literature is in Telugu or Tamil or Sanskrit verses and ashtapadis, so there was a paucity of reference material. There was a lot of time and energy spent on this. I had family, kids, I was not into very intensive teaching, there were not too many students then, Geeta was perhaps the only one and some others. I hardly participated in many of the family functions etc. I think it was a kind of madness that was there with me for a long time. As for how much of it goes in terms of abhinaya, a lot of the verses I've only sung, I found the music fantastic. The possibility of delving and making it into the craft of abhinaya, that is another step altogether. I can't convert everything into abhinaya. It'll become something forced or far-fetched, sometimes contrived. You don't want to do that, you want to go through the natural processes. And in my case, a large part of it I have only dealt with… like the Tanjore pada-varnams, I have done the varnams. With Surdas, several varnams are there, they have what is needed in terms of the total Bharatanatyam experience. In Bhramargeet, the central piece is a swarajati, and the entire philosophy of that Bhramargeet can be put through that. A lot of stuff is highly danceable. I also don't enjoy doing this sitting (she had sat when performing the abhinaya). You do require squatting, getting up, running, showing the child moving, but then what to do, the tragedy of life - after a while, physical disability takes over. 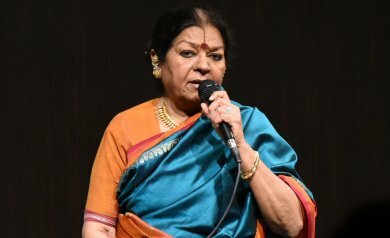 Besides a few like Lata Mangeshkar, who is singing at 90, or Asha Bhonsle, who has the voice of a 16-year-old, the rest of us have to bear this brunt. After a while it makes no difference. I went through ancient Tamil much after I went through north Indian regional texts. The Divya Prabhandam, Thiruvachakam, Sangam poetry, Ramalinga Swamigal, Bharathiyar… a large part of it I fell in love with through the north, although I am a Tamilian. Prabandham is ancient Tamil. I didn't know a word of that. I had a teacher who used to come every day and sit with me for two hours. She had great facility in speaking Tamil, but she didn't know the philosophy of it. That part I was able to do. And the language part of it when I started that, maybe in the 90s, even today, I have to read the 4,000 prabandhams every year. There are phases of the year, I divide it, only Ramcharitmanas, only prabandhams, padavali...," she laughed. I asked Ramya how much importance abhinaya and nritya get in these times, when people prefer the pace of nritta presentations. "I think that nritta and abhinaya are intertwined to any performance. I think nritta should have abhinaya and abhinaya should have nritta. In the sense that even when you do an adavu or a movement, your eyes have to go somewhere, you have to cherish and love that movement. In a way, you're expressing an emotion with your movement, you're not just executing it like a robot, but bringing that humanness to that movement. At the same time, when you do abhinaya, you have a rhythm, like comedians have a rhythm to a punchline. They're intertwined, and yes, a challenge sometimes to do a lot of abhinaya in short performances. I try to incorporate something, but the way that we did it today, it's almost impossible. It requires many years of training and maturity and immersion of a dancer. I have a couple of students who can do that, but many never get to that point, they leave before they can start connecting the pieces, unfortunately. So I have a lot of untouched repertoire." My next question to Ramya was, "In a varnam, you do abhinaya. Suddenly, you have an interlude that is pure nritta. So do you choreograph jathis in a way that they go along with the piece?" "My philosophy in a varnam is that one piece, from beginning to end, is like a story - it has a start, a middle and an end. That, a dancer/choreographer should never forget. The interruptions are the jathis. Sometimes, depending on what the context of the poetry is, we can incorporate elements like stories of Krishna if it's a Krishna varnam or elements of Shiva if it's that kind of varnam, but not all the time. It depends upon the capacity of the dancer. But interestingly, what I found lacking in a lot of dancers I saw this time is fade-in, fade-out. When you do the jathi, you fade out of the emotion, and when you're done, you fade in from where you left off, connecting it, so even though there are interruptions, you should have the connections, you can't do it abruptly. And obviously, if it's a really pathos-filled varnam, you don't want to be smiling brightly and doing it, it's incongruous. You have to moderate the smiling etc., you have to think carefully. To execute a varnam really well requires a lot of maturity - you have to deconstruct, analyze and reconstruct." Shveta Arora is a blogger based in Delhi. She writes about cultural events in the capital.